Burger King along with their media partner Vizeum and JCDecaux, are launching a new dynamic digital out of home (DOOH) campaign in London. The campaign went live in the first week of October and will run through to the 29th on 100 billboards, in proximity to 13 Burger King locations across London. Vizeum, JCDecaux, Posterscope, Liveposter, and Cloud + Compass all collaborated on the campaign for Burger King, creatively executed by 360i. 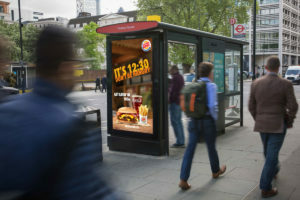 The campaign marks the first time Burger King has used footfall data and events in a DOOH campaign in the UK, allowing for more creative iterations across the digital billboards than ever before. 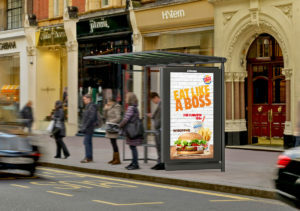 The DOOH campaign is designed to reach on-the-go audiences and tap into real-time needs and desires by sharing relevant Burger King messages around meal occasions throughout the day, including; breakfast, snacking and late night — traditionally light traffic times for the brand. The campaign will be KPI’d against short-term sales uplift across each of these occasions.